Updox, led by a management team with extensive healthcare IT experience, provides customer relationship management, document management, a patient portal, and a secure messaging platform to more than 30,000 users across the world. Updox’s software is a web-based platform that allows for easy integration with both cloud-delivered and on-premise software installations. 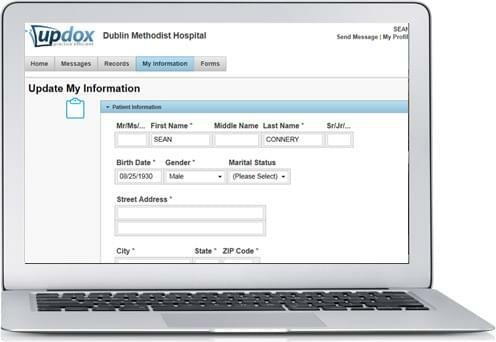 Using the secure, HIPAA-compliant Updox Universal Inbox, providers can access any and all communications, including electronic fax, secure email, and patient messages via the patient portal. They offer an extensive API library that allows for easy integration with disparate systems. The Updox patient portal functionality allows patients to schedule appointments online, receive automated appointment reminders, fill out an unlimited number of custom forms, and send/receive secure messages to/from providers. The system supports broadcast messaging as well, allowing for quick and easy notification to patients when the office is closed, or select groups of patients to receive targeted broadcast messages. Updox allows you to build better relationships not only with patients, but providers as well, as the system can help track referrals. Updox is available directly to independent providers, or via partnerships with over 40 electronic health records vendors, who rely on Updox’s technology to provide tools to assist their users in communication, operations, and achieving Meaningful Use. Not sure if Updox is the best solution for your unique needs? Call, email, or click to chat with one of our Technology Advisors today for a no-cost, no-obligation consultation. Learn everything you need to know about Updox. Our experts will reach out to you shortly.